We have a lot of project vehicles pass through our shop, and there’s one common component that many of these cars possess: an Optima battery. As you can imagine, project cars can sit for a while, and the occasional use of the battery without regular charging can sometimes draw a battery down a bit. 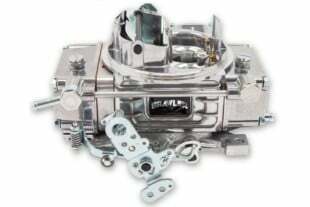 We’ll test a circuit, start the engine to make sure we have oil pressure, check the timing – and then shut it down for a while. All of these short-term uses can drain a battery without really giving it a chance to charge. It’s a familiar scene: car in the garage, hood up, not driven for months. What if your battery doesn’t survive the long winter and those occasional starts that draw it down to less than 12 volts? There’s help from Optima. 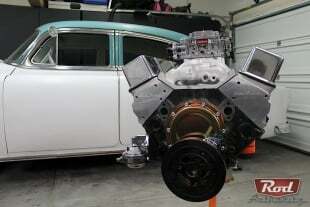 The same can happen to your own project car, and if you’ve ever tried to charge your Optima battery with a regular, lead-acid style battery charger, then you likely know the struggle. Getting an Optima battery to 12 volts isn’t as big a problem as it is keeping it at 12 volts because your conventional charger just doesn’t know how to play nice with an Optima battery. We came across this recent struggle with a three-year-old Yellow Top battery that had been sitting in a car, unused, for quite a few months. 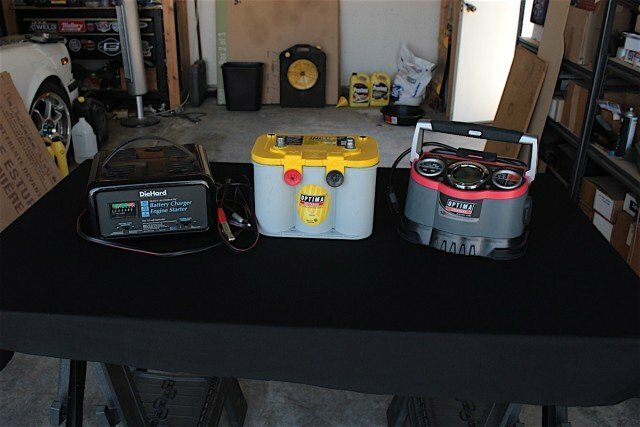 The purchase date was back in 2013, and our attempts to bring it back to a constant 12 volts with our conventional battery charger ended up in disappointment. Unfortunately, one day after testing some circuits, we inadvertently left the ignition on overnight, and that drained the battery down. Our old school battery charger is not a bad charger, but it was not really designed for AGM batteries like our Optima Yellow Top battery. But there’s a new charger in town, and it brings batteries back to a full charge. Honestly, we thought there was something wrong with the battery, because when we gave a full charge the battery would eventually drop down to less than 11 volts – every time we charged it. It was frustrating, because three years shouldn’t kill a battery, and despite the fact that we accidentally left the ignition on overnight, it shouldn’t render the battery useless. So we talked to our friends at Optima Batteries and told them of our dilemma. They had good news for us, and gave us some pointers on charging a drawn-down battery like this with the Optima Digital 1200 Battery Charger. We explained that our store-bought charger was charging the battery, but it would just drop down to a lower voltage after a couple days. The Digital 1200 is compact, but packs a lot of features. It includes a USB adapter, and you can use it to charge your smartphone, too. After talking with the folks at Optima, it wasn’t that we weren’t charging the battery, it was that we were not conditioning the battery. “Conditioning?” you ask? You read that right, and no, our conventional charger doesn’t have that option either. It turns out we were merely putting a charge back to the battery but we were not refilling its reserve capacity. Most conventional chargers won’t have a function for conditioning, but they may have a “maintenance free” option, which is what many conventional batteries are today. That essentially means it’s a sealed battery and (distilled) water cannot be added to it like we did a few decades ago. “Gel and AGM batteries are often confused for each other, but the batteries are very different and gel-specific settings my not fully charge non-gel batteries, and could damage them over time,” he said. So what is conditioning, and why is it so important? We asked Jim, and he said, “Conditioning is the phase where the constant voltage is applied for a specific time frame to desulfate and fully charge the battery for maximum reserve power performance.” He also tells us that the conditioning phase is also done to a standard battery, which not only enhances battery performance, but also battery life. We asked about what happens if we are impatient and we don’t let the conditioning phase complete. “When charging any battery, it is always best to charge completely. When batteries aren’t fully charged, you actually short cycle the charging process,” he said. Top: After connecting the Optima battery to the conventional charger, it was hard to tell what was going on, the indicator is actually a bit confusing. Bottom: When the battery seemed to be at a full charge, we could connect our multimeter to it and watch the voltage drop until it ended up well below 12 volts. 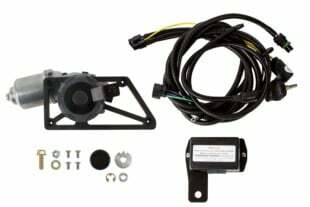 He explained that while connected to a vehicle, if the voltage drops it could be a parasitic draw that is discharging the battery. “If that is suspected,” he said, “it’s a good idea to remove the battery from the vehicle and fully charge it, and see if it exhibits the same behavior when it’s not connected to anything.” This would give us a true answer, but since our battery was losing voltage while disconnected, we were at a loss for what was causing the battery to drop voltage. Optima sent us its Digital 1200 battery charger, and immediately we noticed that there were some additional choices not found on our standard charger. After connecting our Yellow Top battery and making a couple of selections, the charging process began. It’s a long process, but a simple one: you connect the battery to the charger and walk away to let the Digital 1200 do its job. Out with the old, in with the new. The Digital 1200 is a little smaller, and a little lighter, than our old lead-acid battery charger. Even with a "maintenance-free" battery option, our old charger was not charging our battery back to capacity. Typically, it’s best to let the charger work overnight and give it a good ten hours or so and come back in the morning. You don’t have to worry about overheating, overcharging, or leaving it on the charger too long because the Digital 1200 is a smart-charger. When it gets warm, the built-in cooling fan kicks on and cools the charger down. We also noticed that unlike conventional chargers that have 2-, 10-, and 50-amp (start) charge functions, the Digital 1200 varied the charging current when it was closer to reaching 12 volts and 100 percent status. Watching the progress meter, it was much more clear that when it read 75 percent on the indicator dial, the battery condition was at 75 percent. Reading the conventional charger, we never knew exactly what the dials meant because it almost seemed to be reading the opposite. First the Digital 1200 analyzes your battery, then goes to work charging it. You only have to make a couple of selections, and away it goes. The charge amperes automatically changes as needed, with a higher amperage at first to get the initial charge, and then dropping to a lower amperage. Once the battery has been brought back to 12 volts, it doesn't stop there. Then it conditions your battery. Once the Optima charger returned our battery back to 12 volts, there was another step only found on the Digital 1200: conditioning the battery. This is the process that brought our Yellow Top back to life, and seeing it with our own eyes – er, our own multimeter – was where the Digital 1200 made a believer out of us. Once the conditioning was completed, we checked the battery voltage. There will be some residual drop in the voltage until the battery reaches a stable reading, but the real difference was when we gave it a couple days and checked our battery again. When using the conventional charger, we found our battery backed down to under 11 volts within a day. But on day two after using the Digital 1200, our battery voltage was at 12.67 volts; day three, four, and five returned the same reading. Top: After watching the Optima battery drop well below 12 volts after a night with the conventional charger, we were about to toss it out. But Optima suggested we try the Digital 1200 first. 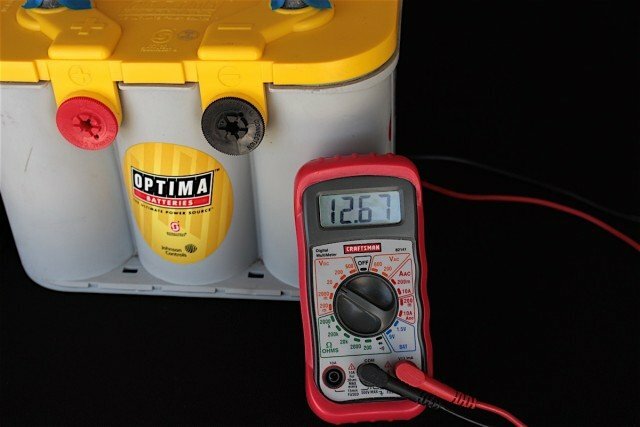 After a night with the Optima battery charger, our Yellow Top maintained over 12 volts, even after a couple of weeks. Bottom: The charger also works as a maintainer with these adapters, so if your vehicle sits for long periods you can be sure your battery is being kept up. Was this a fluke? We wanted to find out, so we put the Digital 1200 on another Optima battery we had in another car – a Blue Top battery. We had an electrical issue that drew that battery down below six volts, which is definitely not enough to start the car. We put the battery on the Digital 1200 and headed in for the night. 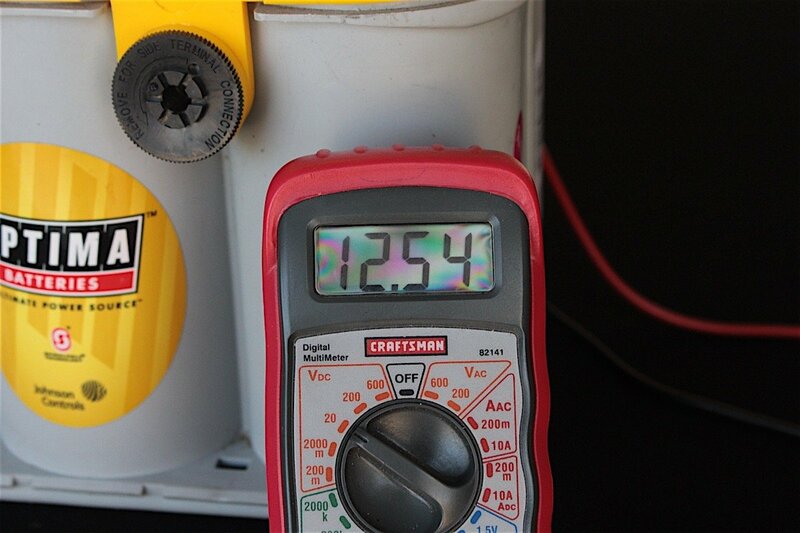 In the morning, we checked the battery and it was back up to 12.64 volts when we removed the charger. We reconnected the battery to the car and we tried the same test: we wanted to see what the reading would be the next day or two; much to our surprise, the battery in the car was reading the same voltage as the Yellow Top that was sitting on the the floor. One battery wouldn’t hold 12 volts, and another was part of an unfortunate electrical issue that drew the battery down to less than six volts. Both were revived with the Digital 1200, and with one sitting on the floor and the other connected to the car, both had the same reading after three days. Even after a month, the Yellow Top battery – despite being used to test motors, lights, and other electrical components – was still at 12.3 volts. The symptoms were similar to what many of us have experienced, and the initial attempts to charge them were probably what you’ve experienced, as well. But the diagnosis wasn’t bleak, we simply needed a better doctor: the Digital 1200, and now our AGM Optima batteries are both alive again. The Digital 1200 has found a new home, and the old battery charger is being retired. 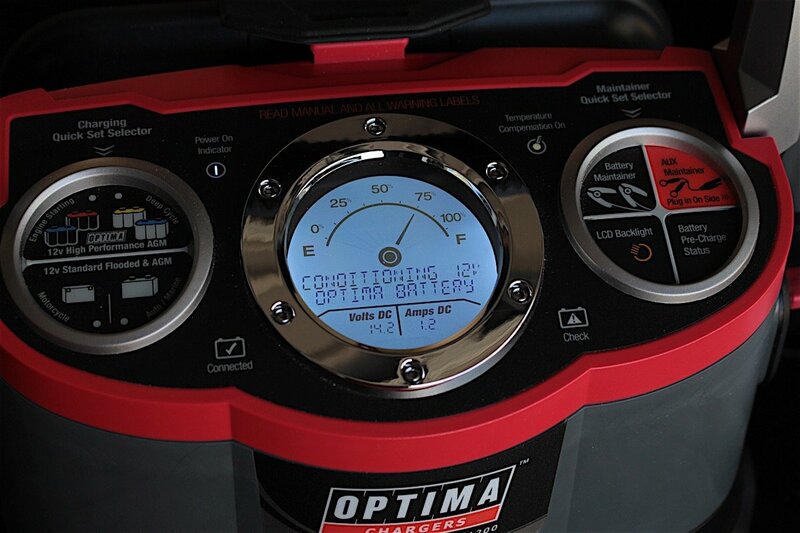 If you have an Optima battery in any of your vehicles, this is why you need the Digital 1200 in your garage: because it’s going to be the one tool that fixes your problem the right way, every time. And once your battery is fully charged, you won’t have to get up in the middle of the night to check it and disconnect from the charger. “After the charging is complete, the charger will enter into its auto maintain mode, keeping your battery fully charged while minimizing sulfation,” Jim told us. “Periodically, the charger will ‘exercise’ the battery by altering the charge profile, further enhancing the useful life of your battery. 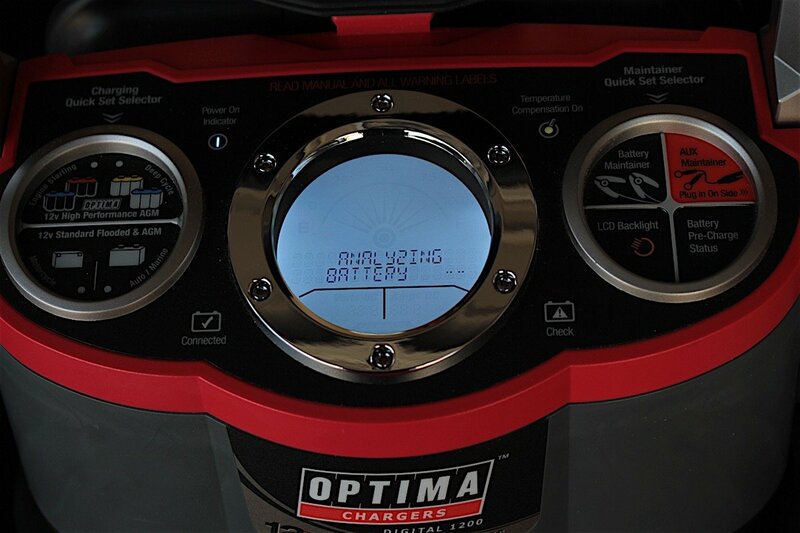 If there’s a power interruption, the charger will automatically resume charging and maintain your battery when power is restored.” That sort of makes the Optima Digital 1200 a “smart” charger, and it’s a wise choice when making a decision on a battery charger. 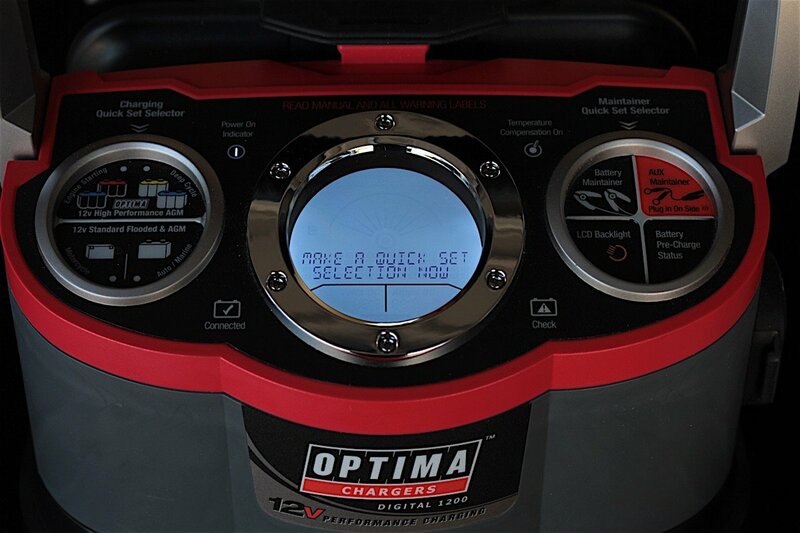 Visit the Optima Batteries website and check out the Digital 1200 battery charger, as well as the Digital 400 battery maintainer and charger. 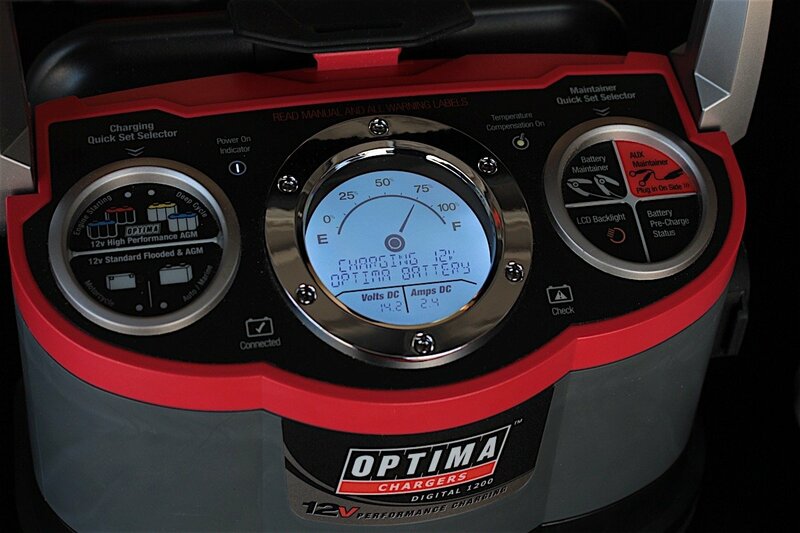 Both will keep your Optima batteries in top shape, and the Digital 400 will keep the juices flowing while your project car, bike, or boat sits over the long winter season. 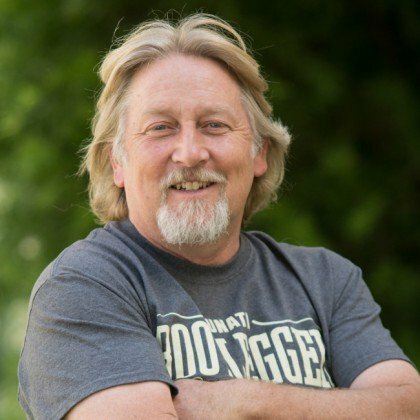 Michael is a Power Automedia contributor and automotive enthusiast who doesn’t discriminate. Although Mopar is in his blood, he loves any car that looks great and drives even faster.